The Medieval Virgin, Vol. 1. This magazine chronicles the struggle felt 由 virgins and 龙 alike as they seeketh to answer ye age-old question, "Do virgins taste better than those who are not?". 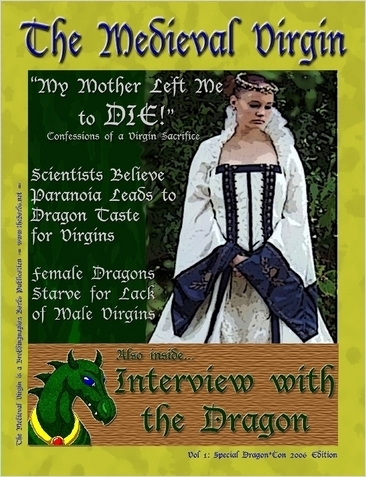 Wallpaper and background images in the Renaissance Festivals club tagged: medieval virgin book magazine image marc gunn dragon virgin renfest fantasy. This Renaissance Festivals fan art contains 动漫, 漫画书, 漫画, 卡通, and 漫画卡通. There might also be 报纸, 纸张, 杂志, 小报, 抹布, and 纸.